It is hard to believe and hard to accept that there are no reliable technical specs on the Defiant, unquestionably one of the most popular starships in the Star Trek Universe. Not even the ship's size is certain. Depending on what is taken as a reference, its length seems to vary between less than 50m and close to 200m. This means an uncertainty of 400% for the length and even 6400% for the volume! Since the DS9 Technical Manual with seemingly accurate deck layouts was released in 1998, the confusion is complete, for the plans conflict with the numerical size figures in the same book. In addition to the size dilemma, there are a number of problems like the uncertain armament, the location of the impulse engines, the existence of a landing gear or the registry number of the new Defiant (ex-São Paulo NCC-75633). These facts are mostly taken from the DS9 Technical Manual. 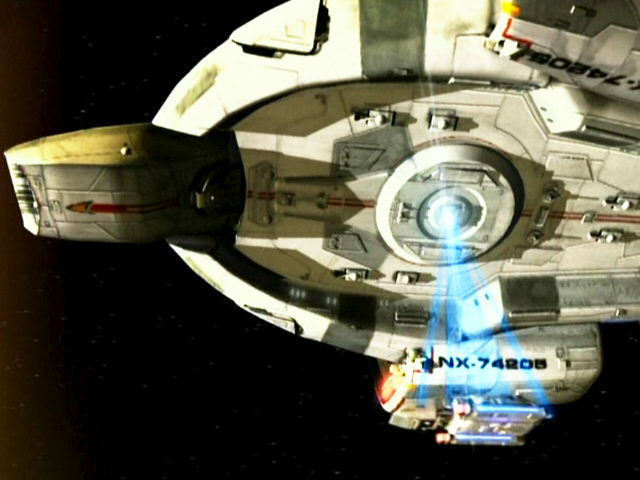 The Defiant class was originally conceived as a response to the Borg menace. The development of the starship started in 2367, just after the disastrous Battle of Wolf 359. An existing spaceframe design with conventional saucer-engineering-nacelle arrangement was the starting point of the Defiant design. This Defiant pathfinder was never built, but the design was modified and eventually used for the Nova class, a planetary research vessel. The Defiant design itself was dramatically altered after it had been decided to compact the ship's structure, abandoning the traditional saucer-engineering hull arrangement and pulling the nacelles directly to the hull. 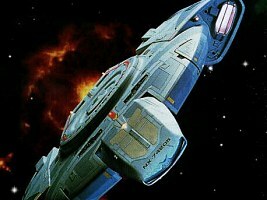 In 2371 the USS Defiant was in her final year of spaceworthiness testing when she was assigned to Deep Space 9 to defend the station against the Dominion. The ship featured a Romulan cloaking device whose use was explicitly restricted to the hostile Gamma Quadrant. While experiences were still being gathered with the prototype vessel, further ships of the Defiant class were built and fought against the Dominion. The USS Defiant herself kept the NX registry until she was destroyed at the Chin'toka system in 2375. 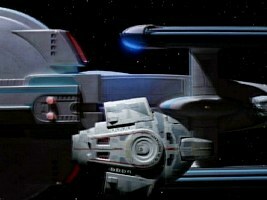 In late 2375 the USS São Paulo NCC-75633 was given to Sisko as a replacement for the Defiant (DS9: "The Dogs of War"). Sisko was authorized by Starfleet Command to rename the ship "USS Defiant", which he obviously did. This information is taken from Star Trek: The Magazine, August 1999, plus personal accounts. 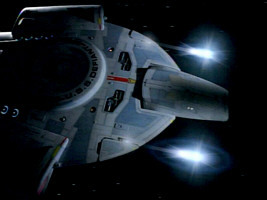 In the real world, the artist Jim Martin began work on the Defiant at the end of the second season of DS9. 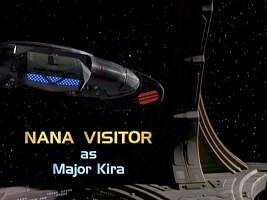 The reasons for giving DS9 a resident starship may have been that the first two seasons were somewhat "immobile"; actually most of the early episodes look rather boring in retrospective. The small runabouts assigned to the station obviously didn't have the potential to render space travel interesting enough, but were merely used to convey personnel from one place to another. The Dominion storyline was a fine opportunity to change this. Martin's first drafts for the still nameless new ship show designs derived from the Danube class runabouts. 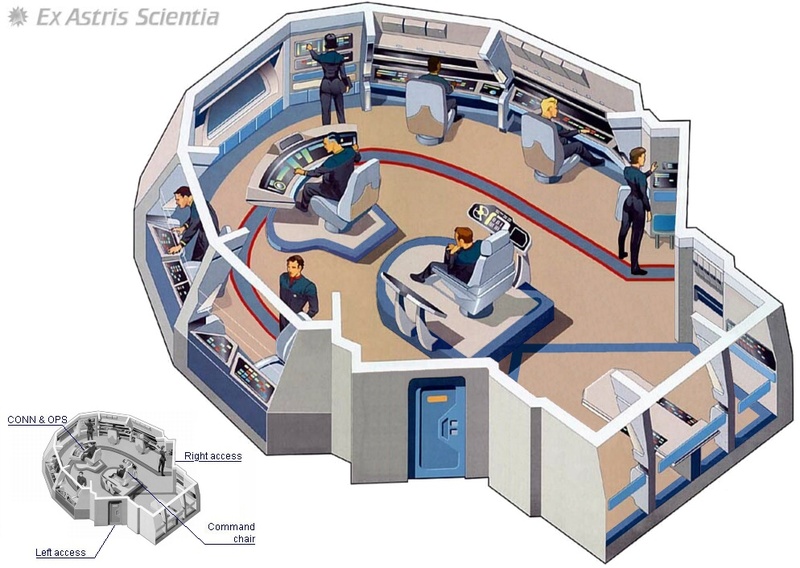 The intention behind that was to use the existing interior sets of the runabouts for the new starship too. Martin: "I started with the cockpit windows, and worked my way out...". The runabout idea, however, was abandoned later. This was obviously a good idea, for the preliminary designs were arguably not large enough to provide more attractive story opportunities than the already available runabouts. One more reason for a larger ship and larger ship sets was the "difficulties when it came to filming multi-character scenes and action sequences". A fully-fledged starship called "USS Valiant" was to be developed now. "I drew some familiar looking Starfleet designs, but also included a drawing of a small, compact ship that I had done for an entirely different episode of DS9." It is a small cargo ship that Martin refers to. His sketches seem to show a chronological development from this first idea of the Valiant to the now familiar Defiant. 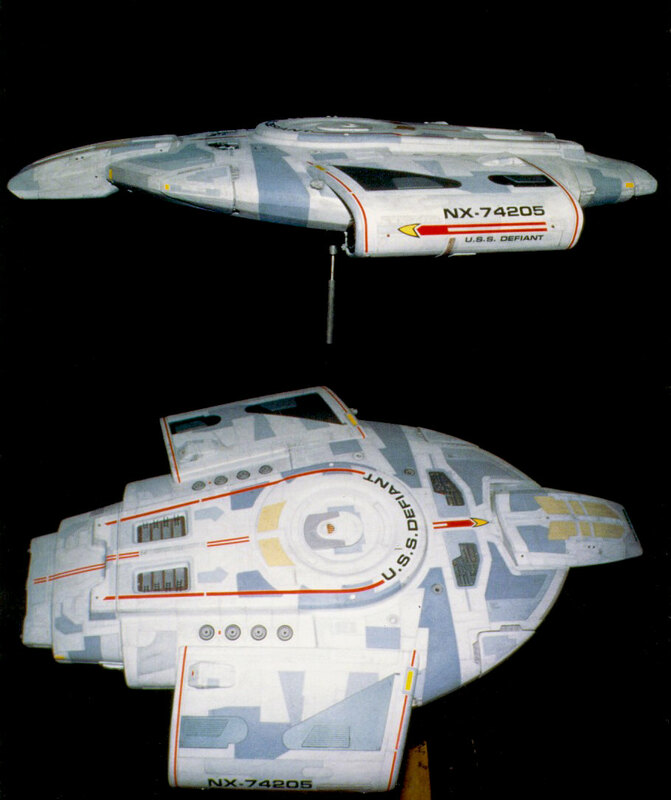 Nevertheless, the final Defiant (at least the front and dorsal sections) rather bares a striking resemblance to the Cardassian Hideki class, which was (no surprise) also designed by Jim Martin. It is strange that this kinship is not mentioned in the big article in Star Trek: The Magazine, but just in an ironic (?) remark in the DS9 Technical Manual that "some classified design documentation[of the Defiant] may have been compromised" - suggesting that the Cardassians adopted the Defiant design for their Hideki class. 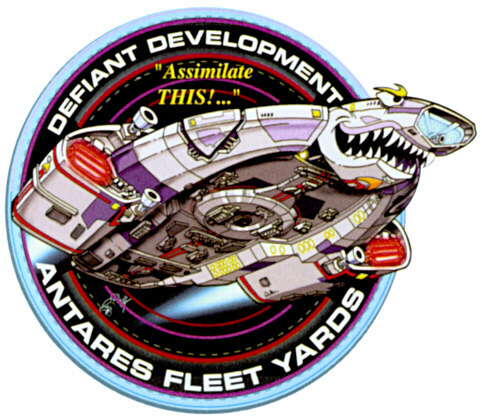 The final Defiant design (image) radically differed from what we had seen as Starfleet ships thus far. The Defiant was not only different because of the unfamiliar arrangement with nacelles directly attached to the main hull and the missing distinction between command and engineering hull. The ship also lacked almost any convenient external evidence of size, like window rows, docking ports, shuttlebay doors or lifeboats. 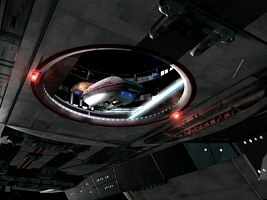 A master system display (MSD) of the Defiant could be seen as soon as in DS9: "The Search" (image). It occasionally showed up in later episodes, and even as late as in "What You Leave Behind". But this early MSD is exceedingly inaccurate. The outline of the MSD is obviously intended to correspond with the ship's hull. But the shape of the hull is overall much too rounded on the MSD, the nacelles are more pronounced parts than on the actual ship, whereas the deflector housing is too vaguely protruding. Most likely this MSD was made before the studio model was finished, maybe Mike Okuda just created it from memory. 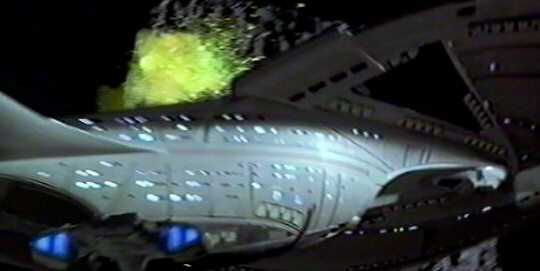 A corrected MSD appeared some time later in DS9: "Starship Down" (image). 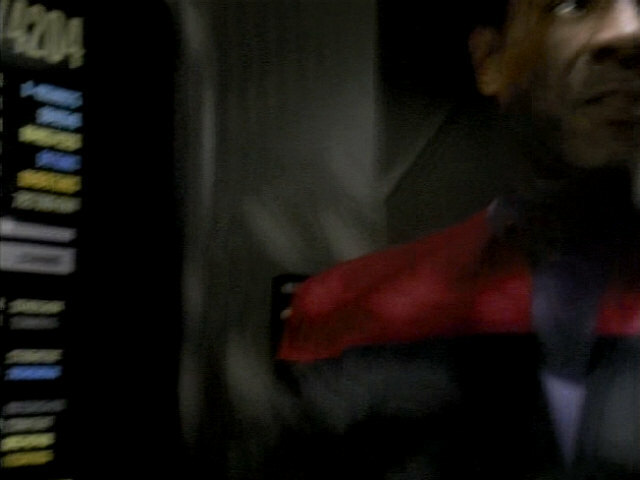 Yet, the incorrect MSD reappears, even in different colors, in a couple of episodes such as DS9: "Past Tense" and as late as in "Sacrifice of Angels". Usually the MSDs are practical size references, for we know that an average deck of a Starfleet ship should be 3.5m, at most 4m tall. The corrected Defiant MSD (image) was modified for the DS9TM and now encompasses four decks. Looking closely, the MSD even shows persons who are 50% as tall as once deck spacing. The question may crop up whether people in the 24th century shouldn't be much taller than the average 20th century adult. The answer is a clear-cut no for which we find evidence in numerous episodes where Starfleet personnel goes on time travel or finds survivors in cryogenic chambers. So we may safely presuppose that the real size of the silhouettes in the MSD is 1.8m, maybe 2m at the very most. This gives us deck spacings between 3.6m and 4m for the Defiant. Hence, if we take the height of the four distinguishable decks as the scale (parts of deck 1 are a bit lower, though), the ship's length would amount to 110m for the 3.6m-deck version and to 122m for the 4m-deck version, respectively. 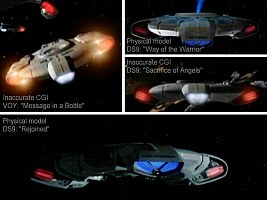 Although the Defiant's MSD clearly shows four decks, some dialogues (in DS9: "Way of the Warrior", "Rejoined", "Starship Down", "To the Death"), suggest there is a "deck 5". It is controversial whether the visual or the aural evidence is more definite. One argument is that the MSD may be merely an artistic rendition of the ship, enlarging the most important sections for the sake of clarity. But then again, could the MSD be of practical use if it didn't show a true cross-section of the ship, if it simply left out complete decks? Another point is that the more detailed MSDs of far larger ships such as the Galaxy or the Intrepid are consistent with the mentioned number of decks, so why shouldn't this be possible on the small Defiant? Unless there is a reference to an even higher number of decks, it would be an elegant solution if "deck 5" referred to the small space underneath the floor of deck 4 (image). 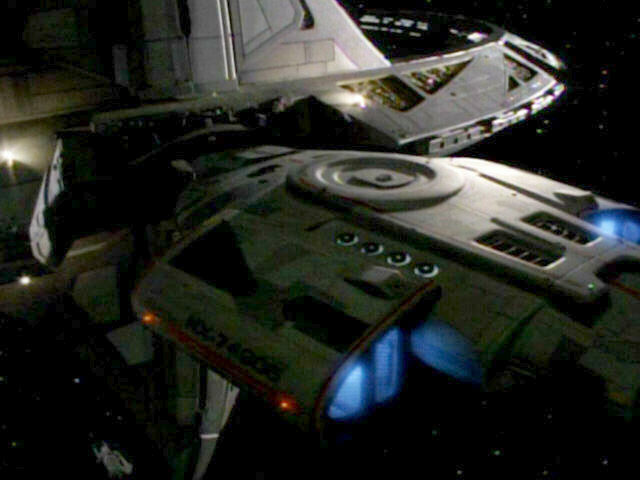 If we superimpose the MSD and the exterior side view of the ship from the DS9TM (image), we notice that the nacelle housings reach further down than depicted on the MSD. 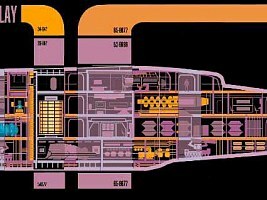 The additional space may be uninhabitable, but it would suffice for a small corridor of 2m height at the inner sides of the nacelles which may be designated as "deck 5". Fortunately, there is no mention of a deck number higher than 5 that we are aware of. 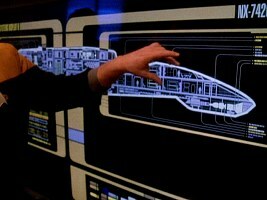 The Defiant interior sets are different from those of other Starfleet ships so far in that the ceiling height is lower. 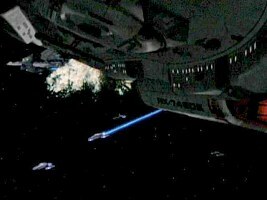 It appears to be at most 2.5m clear height as on the image of a habitation area from DS9: "The Adversary". 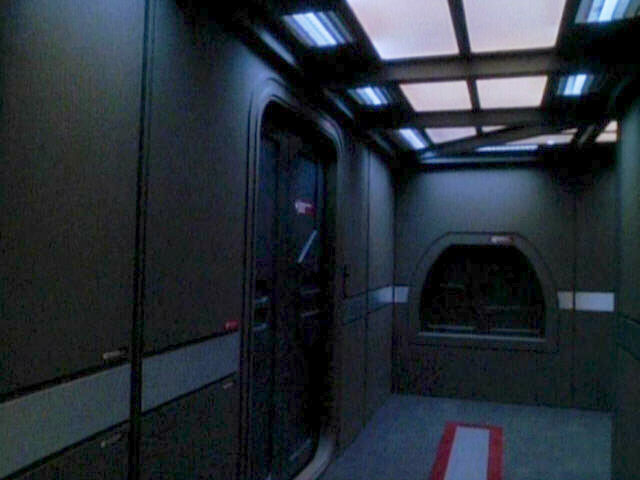 Another image from the same episode shows an even lower ceiling (like we would expect on deck 5). The intention behind this was to give the Defiant the feel of a warship, which is also corroborated by the doors that look like bulkheads on 20th century sea ships. Anyway, the actual ceiling height does not correspond with the clear deck height visible on the MSD with an average of 3.5m for 4m deck spacing. While it is unlikely that complete decks are omitted in the MSD, maybe on this stylized diagram the decks are simply depicted as being taller at the expense of the spaces between them. 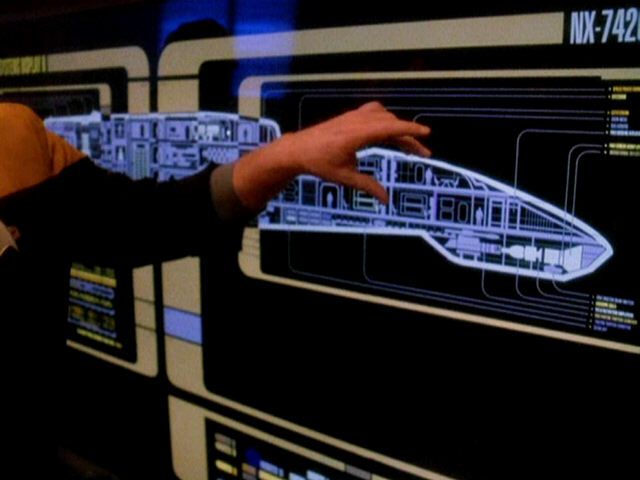 Like on any other Starfleet ship, it is uncertain whether the horizontal Jefferies tubes are actually located on the same level as the decks or whether they run between the decks. In any case, if the clear ceiling height is only 2.5m and the spacing would allow one more meter, there is the possibility that there are Jefferies tubes above and below every deck. On the Galaxy class, by the way, the deck height would not allow additional Jefferies tubes between the decks at all, but the blueprints don't show Jefferies tubes on any deck level either. In this respect the 120m Defiant is even more consistent, in spite of the imprecise MSD. Speaking of external details that may tell us something about the ship's size, there are none. Omitting all the details like windows, docking ports or lifeboat hatches may have been intentional, since the ship's size was apparently never definite in any stage of its creation. 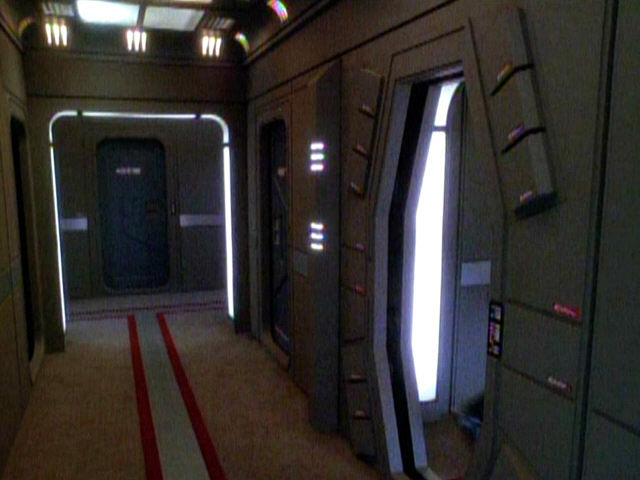 There are two rows of lights (image) facing the interior of the ship which may be some kind of windows, but which wouldn't make much sense on these lower deck (s). Moreover, this would mean there are either 8 decks altogether if we understand the light distance as deck height, or the lowermost deck 4 or 5 would have two impractical window rows close to the ceiling and close to the floor. The Defiant is most often shown at a size of roughly 120m, but there are exceptions ranging from 50m to 170m. Visual comparisons like with the Klingon BoP, the station Deep Space 9 or the Jem'Hadar fighter are usually not reliable, since their dimensions are in doubt too. Nevertheless it is interesting to note that the sizes of the Defiant and Martok's Bird-of-Prey match if the Defiant is 120m and the BoP has the original design length of 110m. There would have been absolutely no need to introduce still another alleged VFX size of 135m for this particular BoP to match a 170m Defiant. In relation to Deep Space 9 (image from DS9: "The Search") the Defiant looks like a bit more than one tenth of the station's diameter. The originally intended size of the station must have been less than 1km, as indicated by the Ops and promenade deck sets, but was usually scaled up indefinitely in VFX shots to 2.5km or more -- especially next to Galaxy- and Nebula-class vessels. This huge size is hard to maintain even if we favor a big Defiant. This may have been one reason for the DS9TM to settle on a diameter of 1450m which seems like a compromise to let the deck plans of Deep Space 9 look half-way reasonable. 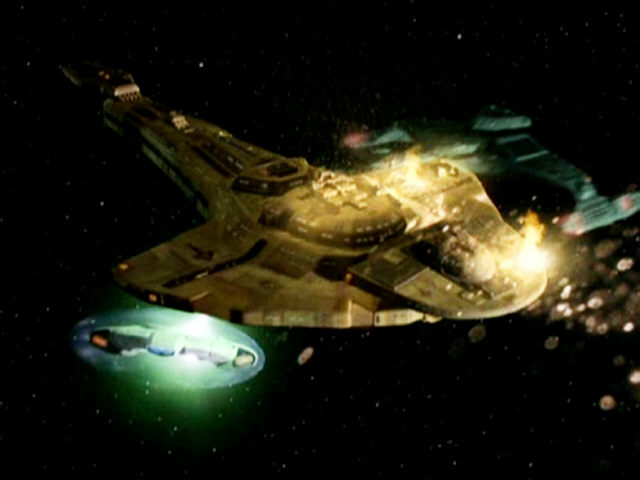 In DS9: "The Way of the Warrior" we can see the Defiant next to the Vor'cha, where the Klingon battlecruiser is four times as long or more (image). A second very nice comparison with a ship of known size is possible in DS9: "Paradise Lost". If the Lakota as an Excelsior refit is 469m long, then the Defiant measures at most 139m (image), most likely several meters less, depending on the unknown camera distance and lens. There are, however, a few VFX scenes that really cause problems. The Cardassian Galor class is another possible reference ship, although the supposed design size of 481m of the Galor was allegedly decreased to 366m in DS9's VFX scenes. Anyway, if the Cardassian ship Kraxon measures 481m in DS9: "Defiant" (image), the Starfleet ship could be at most 50m long! It wouldn't exactly help to assume that the Galor class is still smaller. The reason for the Defiant being that tiny lies in the plot. 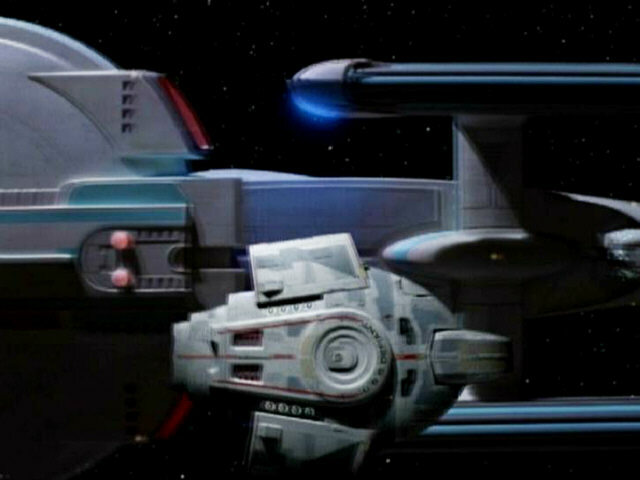 The Kraxon extends the shields around the Starfleet ship (which has been stolen by Thomas Riker) in order to protect it from the Keldons of the Obsidian Order. More evidence for a tiny Defiant can be found in "Star Trek: First Contact" when Worf's ship is shown in front of the Enterprise-E and appears to be only 50m long (image), even if we are generous with the camera angle. Vice versa, the Defiant is just huge on two other occasions. 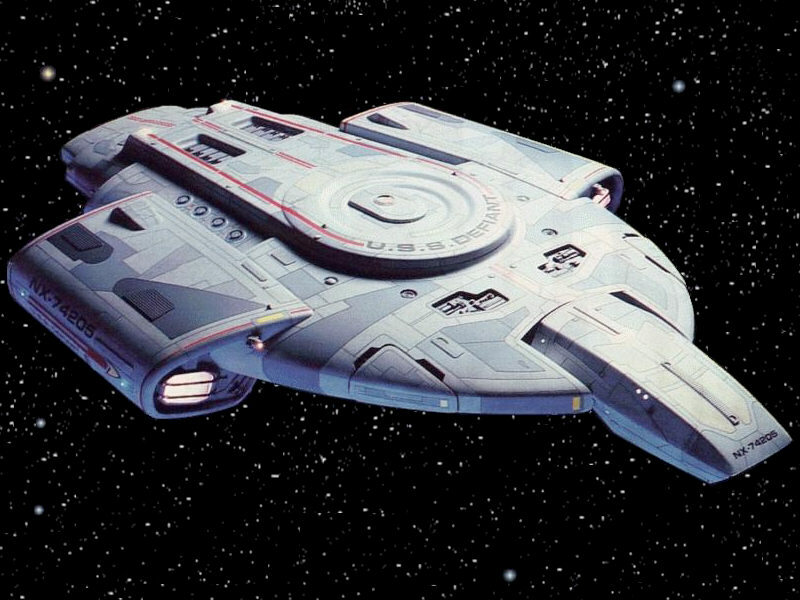 In DS9: "By Inferno's Light" a 23m long Danube-class runabout is tractored by the Defiant (image). This is the most definite of few shots that require the Defiant to be 170m long. More evidence along the same lines comes from DS9: "Sacrifice of Angels" where several Starfleet fighters are visible in front of the Defiant (image), and here the small vessels don't seem to be much longer than the aforementioned runabout. The new shuttlebay (see also the other problems below) showed up only in DS9: "Sound of Her Voice". The length of the shuttle was less than two thirds of the hatch diameter (image). The size relation in the DS9TM (see below) is different, but after all the show is the canonical evidence. The problem is that the hatch which seems to have the same size as the original tractor beam structure would be only 8m wide on a 120m ship, while the shuttle is supposed to be 9.6m long, according to the DS9TM. It is obvious that the door would be much too small, and even on a 170m Defiant the relative sizes of the shuttle and the ship wouldn't be quite correct. 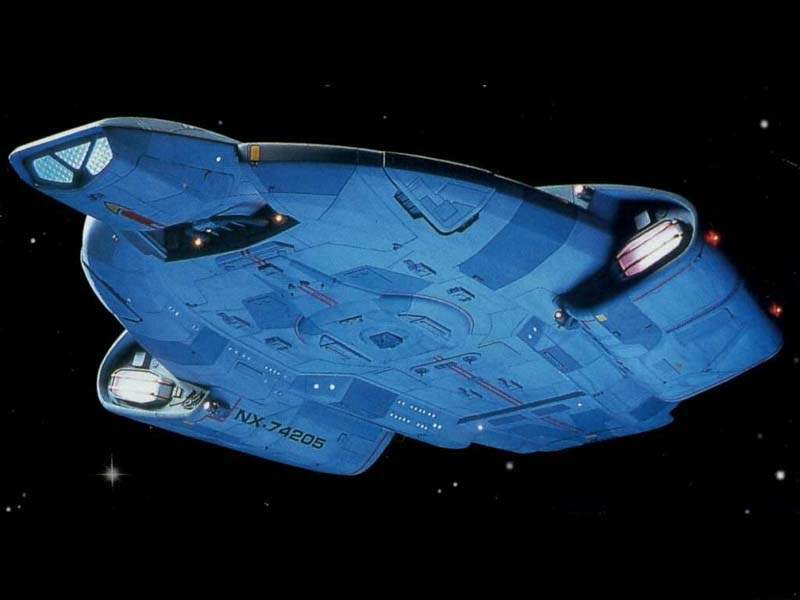 The Star Trek Fact Files (File 28/1) give us a length of 68.58m for the Defiant. The "precision" of the decimals may be regarded as funny, but this results in exactly 225 feet. Anyway, this is definitely too small to accommodate the interior sets, weapons, engines, fuel, let alone the three shuttles. We may easily disregard this size figure which may come from an early production stage when the Defiant or the Valiant was still regarded as some sort of super-runabout. The rest of the information on the Defiant is very indefinite. While the set depictions of the bridge or the briefing room are rather precise, there is no information on where they are located on the ship. 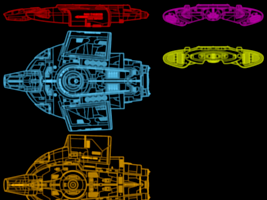 The Fact Files have somewhat detailed five-view schematics of the Defiant. It is only strange that the length-to-width ratio of the Fact Files schematics of 1.46 doesn't correspond with the size figures in the DS9TM which yield 1.27. This need not necessarily touch the length issue. I suppose that the Fact Files drawing was accidentally lengthened, considering that the length-to-width ratio of the depictions in the DS9TM is 1.3 and therefore closer to the numerical value of 1.27 in the same book. The Fact Files diagrams are inaccurate anyway, since the deflector housing is too much tapered and too narrow, and the shape of the warp nacelles in the side view is strange too. The DS9TM diagrams consistently show a small Defiant. The MSD depicted in the book (the big one in the appendix) seems to be derived from the one seen in the show and would therefore support a length of at most 120m. The same applies to the deck plans. Only the bridge would be a bit large. The actual set is roughly 6m x 7m, and it would be 8.2m x 9.2m on a 120m ship. The sizes of the corridors, staterooms and especially the restrooms, on the other hand, seem to be reasonable at 120m overall length. The Type-10 shuttle would be less than 7m long in this case. The numerical size figures in the DS9TM, on the other hand, for the Defiant as well as for the shuttle are simply scaled up to correspond with a 170m ship. It is obvious that the bridge would be huge beyond reason (12m x 13m) in this case, and although we have probably never seen them, 5m x 3m large luxury bathrooms wouldn't make much sense either. 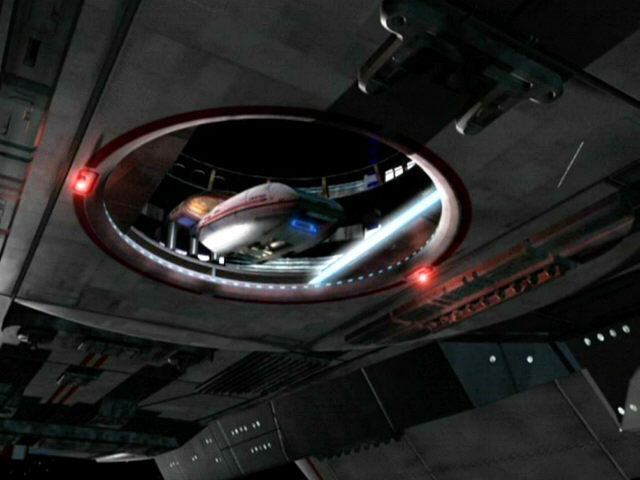 Still, it is remarkable that the 9.6m shuttle, the Defiant, and the shuttlebay hatch would match in size, unlike it was the case in DS9: "Sound of Her Voice". It is also worth mentioning that the 120m deck plans are reproduced such that the scale would be exactly 1/1000 for a 170m ship. The engine room is located on the decks 1 and 2, according to the DS9TM. This is in contrast to Worf's efforts in DS9: "Starship Down" to get from engineering to the bridge. Why didn't he just take the ladder to get to the upper engineering level? It's the same problem with the deck 2 that had been sealed off after a hull breach (dialogue), but people are still working as usual in engineering on deck 2. 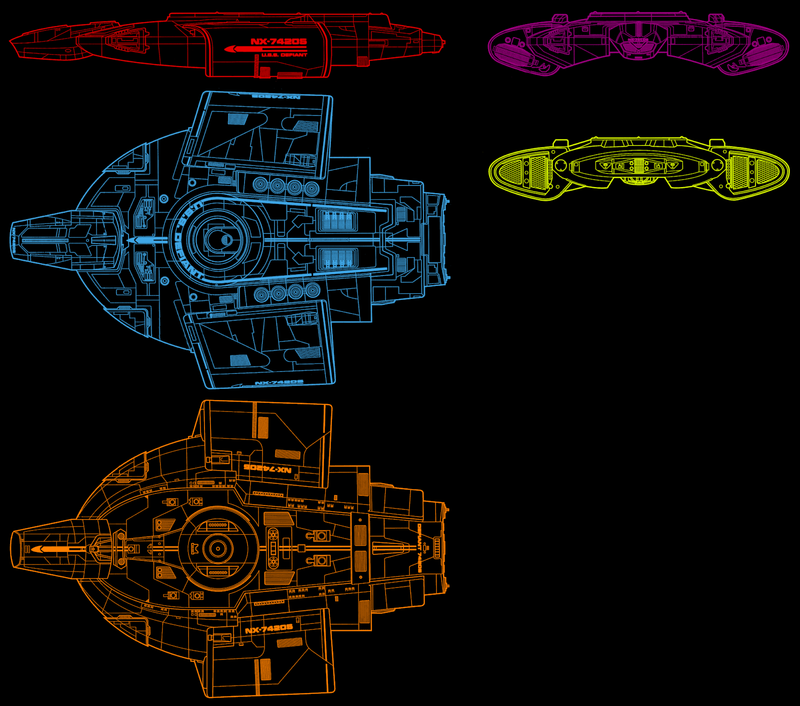 The size of the Defiant as depicted on the size chart depends on the reference ship. For more information, have a look at my analysis of this chart. Anyway, it is obvious that the Defiant is supposed to be about 170m, but this is no conclusive evidence. It is only interesting that this is the first occurrence of the 170m Defiant, knowing that the Encyclopedia II was released prior to the DS9TM. A diagram on this CD-ROM reference shows a deck count of six (image). This may have been the basis for a six-deck Okudagram that may have been used in the turbolift in late season 4. The six-deck version would make sense at 170m. 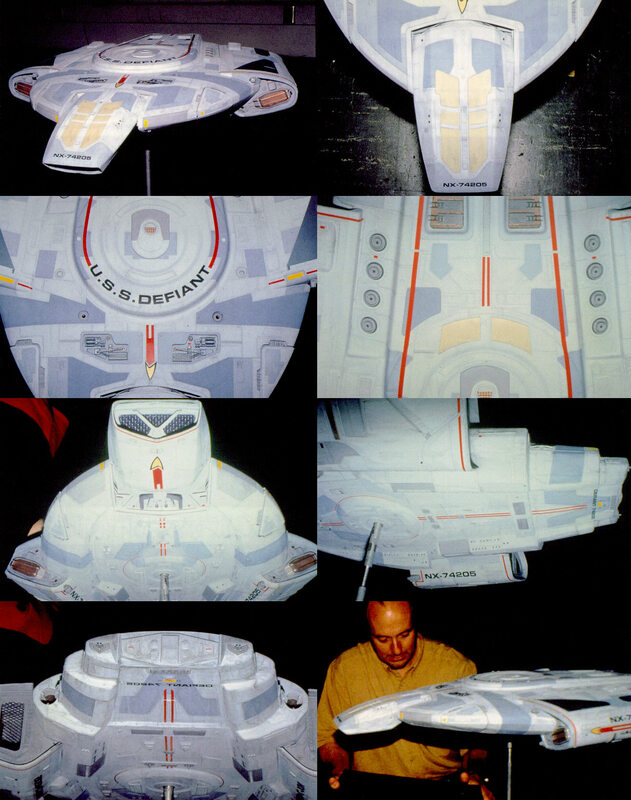 Doug Drexler wrote at his former website Drex Files: "The size of the Defiant was a hot potato from day one. Rick Berman wanted a small pocket battleship (a couple times longer than a runabout, with the girth of a regular starship), Gary [Hutzel] wanted at least 500' (152.4m)." 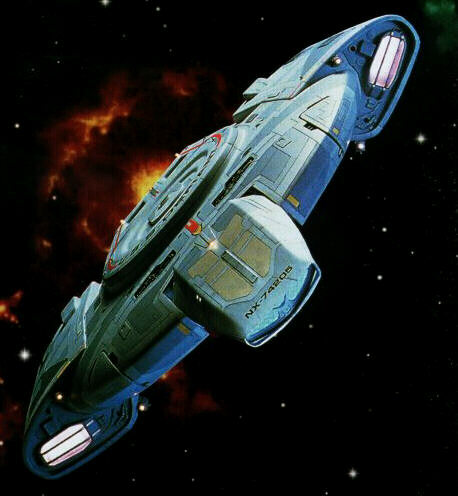 According to Gary Hutzel in the DS9 Season 3 DVD special features, the Defiant was to be "a new hot battleship that would really set a new standard for an action ship in the series. First, there was lots of talk like 'How big is the Defiant?' Well, we'll make it really small and really powerful, that it would be so powerful and scary, nobody would mess with it." According to a post in the newsgroup alt.tv.star-trek.ds9 by DS9 Visual Effects Supervisor David Stipes, the scale of the Defiant CG mesh was 560 feet (170.7m). This is also the origin of the figures given in the DS9 Technical Manual. Doug Drexler, on the other hand, drew the MSD and the deck layouts, for the series as well as the DS9TM for a 420' (128.0 m) Defiant with four decks. 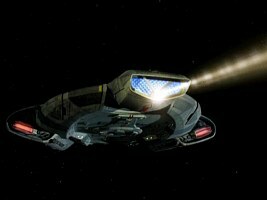 New opening credits with a faster pace were created for the 4th season of DS9, and they now included the Defiant. When the Defiant comes into sight we can see that the deflector position on the model is too low. There is a step between the upper deflector surface and the main hull surface, which isn't present on the studio model as we know it, and which is apparently unique to the opening credits. Actually, the Defiant in the credits is a CGI (probably the first one made of the ship). In the DS9 Companion Dan Curry is quoted as follows: "At the time we were working on the new title sequence, Gary Hutzel was supervising the visual effects on ‘The Way of the Warrior’. There wasn’t enough time to the model for both of us to use it. I let Gary have it and I worked with VisionArt. I pushed pretty hard on issues of lighting and stuff like that, and they were able to create a CG Defiant for us that’s mixed with the physical model of the space station. I’m positive that most people don’t know it’s CG." It appears this CG version is indeed exclusively used in the title sequence. 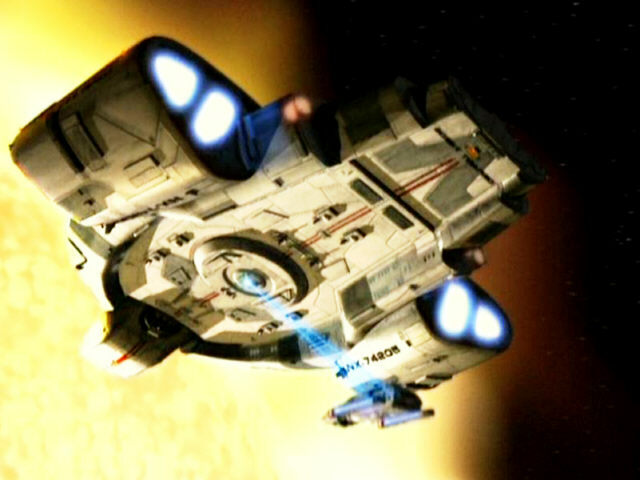 Another early CGI of the Defiant used during the sixth season, most notably in the battle of DS9: "Sacrifice of Angels", looks strangely distorted (image). The deflector opening is not located low enough, as is evidenced in the comparison of the head-on view from "Sacrifice of Angels" with two shots of the physical model, one from slightly below the centerline (DS9: "Rejoined") and one from above (DS9: "Way of the Warrior"). Even more obviously the deflector is much too narrow or too tall on the CGI. More differences show up when we look at the nacelle casings. They slope down forming an inverted "U" on the physical model, whereas their upper surface looks almost horizontal on the CGI. Curiously the first inaccuracy is exactly the same as on the five-view schematics in the Star Trek Fact Files, and the engines are not quite correct in the magazine either. This can't be a coincidence. The Fact Files were released in 1998 and the Defiant schematics were in an early issue, so they must have been prepared some time prior to the publication. The sixth season of DS9 started in fall of 1997, so it is not completely sure who made the error in the first place, the Fact Files artist or the 3D modeler. In any case we should disregard the differences between the physical model and the (somewhat clumsy looking) first CGI. The location of the impulse engines is an odd problem. All screen evidence of the Defiant without exception from the very first appearance clearly exhibits two red glowing lights in a hull ledge behind the nacelles. 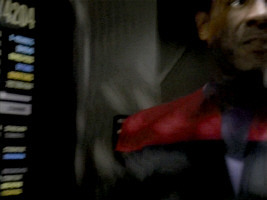 These are beyond doubt supposed to be the vessel's impulse engines (image from DS9: "By Inferno's Light"). Conversely, the diagrams in the DS9TM show three huge impulse engines at the very aft end of the ship although in the exterior views there is absolutely nothing in these places remotely looking like impulse exhausts. The DS9TM suggests that "the exhaust products may be held temporarily in the impulse nozzle cowling, to minimize the ship's ion or EM signature, or they can be vented through electroporous plates along the trailing surface of the cowling". 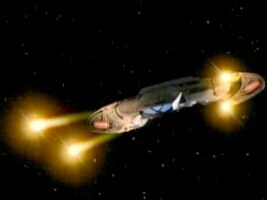 We have to wonder why the DS9TM didn't put the impulse engines where they obviously are in the series and instead of that makes up an excuse why no plasma exhaust is ever seen at the aft end of the ship. The Fact Files, on the other hand, show the impulse drives where they belong. The Defiant has a complement of nifty weapons, including pulse phaser cannons and torpedo launchers, but their locations are anything but consistent in the reference publications although there would have been plenty of very good screen evidence. There are four pulse phaser cannons on the forward ends of the nacelles (image), two above and two below the hull center line. These cannons were seen in action in several episodes in a very consistent fashion. 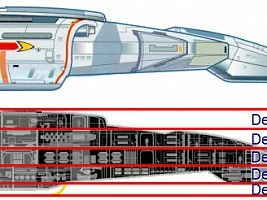 While they are all correctly reproduced in the DS9TM cross-section as well as in the main text about the Defiant weapons (Chapter 14.0), the lower cannons are missing in the deck plan. The Fact Files show only two pulse phaser cannons and move them to the triangular sections in the forward main hull which is definitely wrong. Actually, it is the Defiant's quantum torpedo launchers that are located in the triangular sections. The torpedoes consistently emerge from the small gaps between the triangles and the rest of the hull. If we disregard the wrong pulse phaser cannons, at least this is correct in the Fact Files depictions. 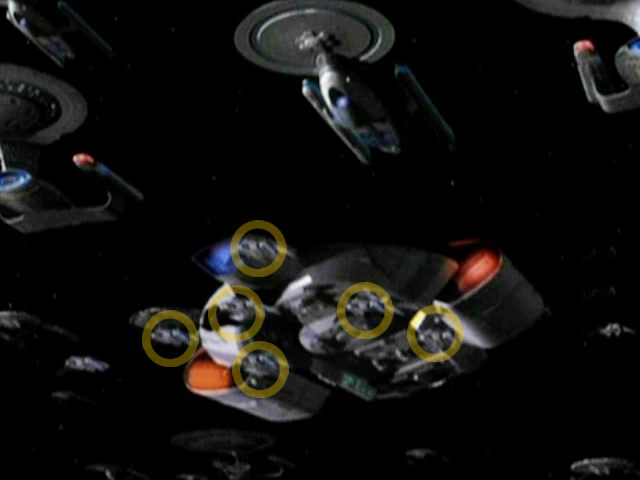 Although they were seen in more than one episode, the torpedo launchers are completely missing in the diagrams of the DS9TM, where there are only targeting sensors instead. According to the main text about the Defiant weapons in the book, the quantum torpedo launchers are supposed to be in the nacelle cowlings. While there may be an according hatch in the nacelle forward ends (see upper left part of the image), I don't recall any scene of the Defiant firing anything from there. 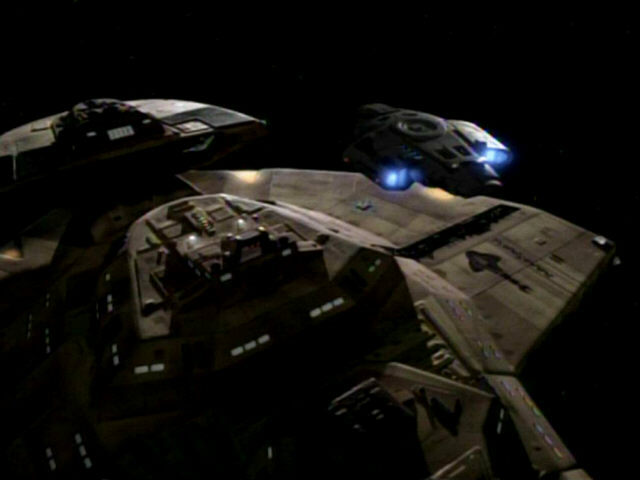 Besides the pulse phaser cannons the Defiant also has at least one conventional dorsal phaser, as it could be seen in DS9: "Shattered Mirror" on the Mirror Defiant, but also on the real Defiant in "Paradise Lost" (image). They are not mentioned in any publication. There may be conventional phasers on other parts of the hull to, although nothing like that is visible on the studio model. 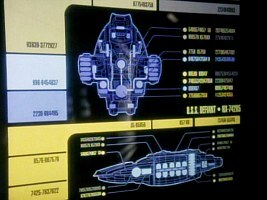 A torpedo/probe launcher and beam emitter is located in the main deflector (image from DS9: "Rejoined") and is correctly reproduced in the DS9TM diagrams. 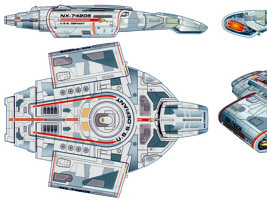 The DS9TM (cross-section and deck plan) also shows two additional rear torpedo launchers on either side of deck 4, as they were mentioned in DS9: "The Die is Cast". There are, however, no openings in the corresponding spot on the studio model. The actual impulse drive exhausts which are ignored by the DS9TM would not be a suited place, since these are on decks 2 and 3. 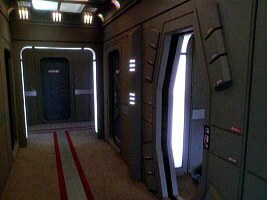 The Defiant crew enters and leaves the ship through a docking hatch in the navigational deflector when it is docked to DS9 (image). 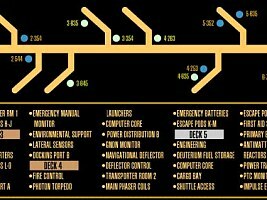 This is reproduced in the DS9TM schematics too. The problem is that there is nothing visible in the deflector housing that could be an airlock (see third row, left image). The existence of the aforementioned torpedo launcher and beam emitter just where there is supposed to be a docking hatch too don't exactly facilitate the problem. The Defiant has a flattened dome on the bottom which was originally holding a tractor beam emitter (image), as seen on an early bottom view of the ship and on the "Assimilate This!" starship development plaque and as it was used in DS9: "By Inferno's Light" (image). The structure is exactly facing the round ring around the bridge on the top side. 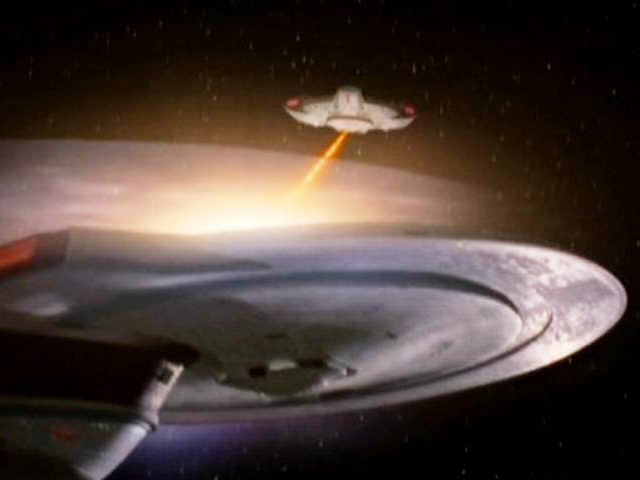 At some time prior to the sixth season the tractor beam emitter must have been replaced with a shuttlebay hatch (image), as seen in DS9: "The Sound of Her Voice". 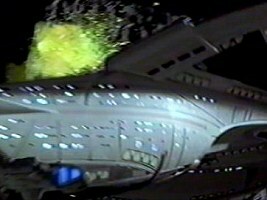 The DS9TM explicitly states that the shuttlebay was a later addition, so the slight modification of the ship's underside is plausible. The Defiant has landing struts according to the DS9TM (MSD image), but they have never been shown. It is questionable anyway if the ship is capable of atmospheric flight and landing on planets, since this would have been an option in several episodes, so why was it not even proposed or mentioned at one occasion? It could be possible that the relatively small Defiant was designed to use the shuttlebays in starbases, hence the landing gear. Side note The real-world reason for the Defiant never landing is that the producers were not aware that there were landing struts visible in the MSD. Ron D. Moore said in an interview with LCARScom.net: "The Defiant has landing gear? You have to remember that things like CD-ROMs and the various "official" manuals put out by Paramount are not done in conjunction with the writing/producing staffs and that the authors are usually simply extrapolating information based on what's actually been seen on screen." The USS São Paulo was renamed in honor of the destroyed Defiant (DS9: "The Dogs of War") and should have kept the registry NCC-75633, but unfortunately the ship was only seen as NX-74205 (image) in "What You Leave Behind" due to the extensive use of stock footage. Even the new scenes showed the old number. There is no way to deny that the new Defiant is NX-74205 again, although this number is illogical. Side note A definitely wrong registry appeared on the original Defiant. 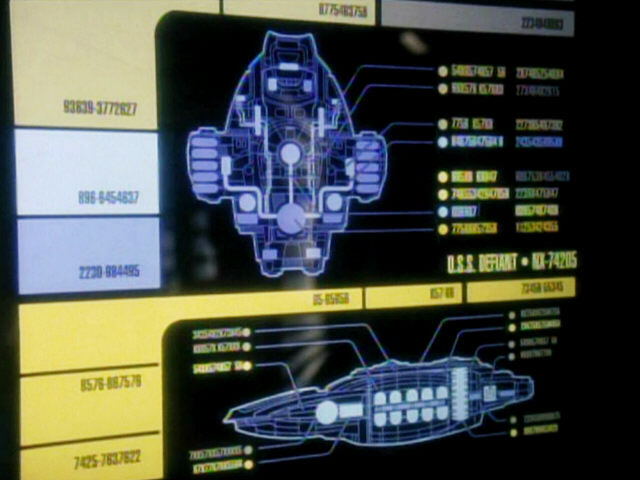 In "The Search", we can see an LCARS screen with the registry "(NCC-)74204", which is overruled by the overwhelming evidence of "NCC-74205", of course. The Defiant model was suffering from a lack of reliable specs from the very beginning. Obviously no one bothered to conceive something like a writer's guide or VFX guide before the ship was rushed into action. Virtually the only known facts were that the Defiant was rather small, heavily armed and had a Romulan cloaking device. It is obvious that later publications could not compensate for the errors that had already been made. At some point, after the ship had usually been shown at 120m, someone must have suggested or decided that it should be actually 170m. By doing this, many more problems were created than could be solved. 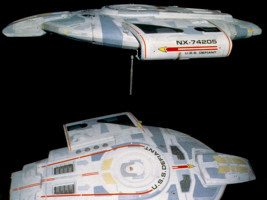 The result was that the diagrams of the 120m ship by Doug Drexler were combined with size figures of a 170m ship in the DS9TM. Either that, or Drexler did not pay attention to the size even after he had been given the 170m figure that already existed since the Encyclopedia II, and he just took the existing bridge and engineering sets and tried to fit them into a ship of undetermined size - which accidentally turns out to be between 100m and 120m long. 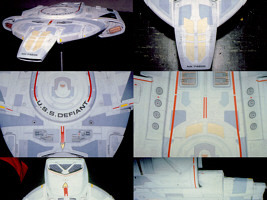 Still, there is no clear trend that the Defiant was really larger in later episodes. Summarizing, most of the on-screen size evidence, including most VFX shots and the MSD, support a Defiant of roughly 120m length. Taking this into account, even the very definite contrary arguments, like the size of the Type-10 shuttle, have to be accordingly weighted such that not the whole issue is screwed up only because of one or two pieces of evidence. There are both VFX scenes which show the Defiant at either a larger or a smaller size, so it is a compromise between these incompatible facts too if the ship is actually 120m long. The main reason why rather the 170m length is widely accepted may be that it is quite comfortable to refer to a printed figure. Some of the information on this page is taken from the now defunct site Maximum Defiant. I am also grateful to Boris S., Frank Gerratana, Davok and Gary Burch for invaluable discussion and additional material. Thanks to Mick Sinnott for the hint about the possible location of deck 5. Thanks also to Sebastian, who pointed me to the low deflector in the opening credits, to Adge for the screen capture showing "NCC-74204" and to Greg for the hint about the "official" statements on the ship's size. My thanks to several other people, especially at the Flare Sci-Fi Forums. Finally, I would like to express my gratitude to Jörg Hillebrand, who has compiled countless screen grabs of the ship for me.